Swiss Watch Tips, News & Reviews To Polish Or Not To Polish Your Watch? You received your brand new watch a few weeks ago and today, horror of horrors, you knocked it on the sink faucet giving your watch a bright shiny new scratch. Or maybe you work in front of a computer and the buckle is already starting to show the classic ‘desk diver’ swirls. Scratches are unavoidable. Some enjoy the authenticity of an unpolished case, the decades old scratches that tell the story of a vintage watch and those people might recommend you never polish your watch. Other owners will rub away engravings constantly worrying at their watch with Simichrome and tell you the watch still looks like new when the metal has been rounded and the original finish is beyond recognition. Fortunately, most wear accumulates on the on the outside facing parts of the watch, bracelet and buckle, not parts that are usually visible to your eyes when you are wearing it. So what’s Bernard Watches’ take on polishing? Moderation to abstinence. Few watches are ever going to be of special interest to collectors and auction houses who will want to see an unpolished case and have everything original, but if you know your watch is one of those, like a Rolex Sea-Dweller, or a Patek Philippe Annual Calendar or suspect it might become a collectible, like a sword-handed Omega Seamaster Professional, then take special precautions when sending your watch in for service. 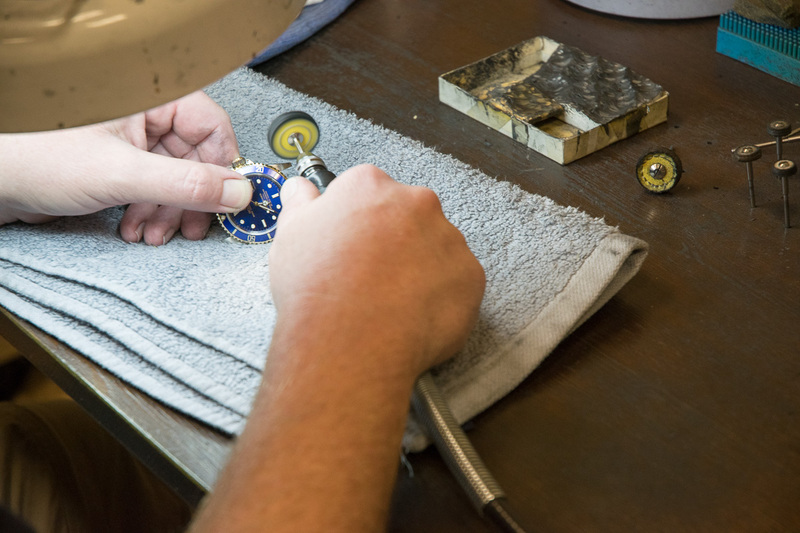 Service centers will honor requests asking them to refrain from polishing your watch and often will honor requests to return any original parts that might have needed to be replaced. If you are thinking of selling or trading your watch, we recommend you decide whether you want to sell or trade the watch to an end user or a watch dealer before you have it polished. A dealer is going to want your watch in as close to original condition as possible, so they can decide how to any work should be done and make sure it is done correctly. An end user is going to want to see the watch in the nicest condition possible, but this adds to the expense and hassle of selling a watch on your own. If your watch is not necessarily unique or rare or for sale, and is simply your baby that you plan to keep forever and just want to see in a better condition, let a professional do the work and try not to have it done very often, no more frequently than you would have the movement serviced, every four to seven years. A professional polisher takes into account the edges of the watch and will work to keep them sharp, not polishing away too much metal in order to remove a negligible scratch in a hard to reach place. The really good polishers will take apart the watch before working on it so they can give each part separate treatment. Factory service centers and large independent service centers will do this. Whatever you do, don’t try to refinish a watch on your own with a Brillo pad or Simichrome polish. Be very careful who you consider a “professional”, before you hand over your prized time piece. The jewelers in my area have caused far more damage to my watches than I have. Simply adding or removing a link on the bracelet for the season change on my Omega Seamaster Aqua-Terra is more than many of them can handle. Of course when you point out the scratches, and flared screw heads they cause, the reply is “it was already like that”. I finally wised up and purchased a watch repair kit, and do it myself. Havn’t had a problem since. P.S. I really like your blog! After acquiring and wearing the Rolex 116610 for now just under 24 hours I’m happy to have discovered your blog; thank you for producing this. To those who still thinking about having anyone with the exception of the factory polish your watch, think about it twice before you do it. I just took my new Omega Seamster back to my Omega dealer so that he could see a bad nick that I had on the Bazel. The dealer told me that he could repair it free of charge and is left my beautiful watch with him for about 2 hrs. I got it back and found out that he polished and scratched the ceramic bazel, took the coating of the exterior anti reflecting coat near the nick and scratched a bigger spot near the nick. I regret that decision. Anyway to those who are thinking about the jeweler repairing your beautiful watch, think again before you do it.